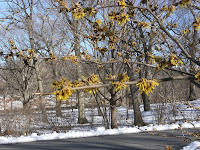 Last week I stopped by the Arnold Arboretum to see the first sign that spring is just around the corner: the witch hazel trees are blooming. 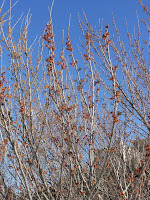 Hamamelis blooms in late winter, and a few of the arboretum's specimens near the ponds were in bloom. More will likely bloom within the next week or two. How can you tell that spring is coming? 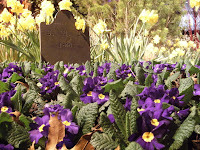 With the arrival of the flower and garden shows in late winter. Last weekend I took in the Rhode Island Spring Flower & Garden Show, a modest-scale event that is a nice afternoon for peeping, photographing, seed and bulb shopping, and magic-watching. The Boston Globe reported on Thursday that the Boston Flower & Garden Show will be making a comeback next month after a one year hiatus following the "financial meltdown of its producer, the Massachusetts Horticultural Society." In the interim, locals have had to make their way to another city -- such as Providence, Rhode Island -- to stop and smell the roses. 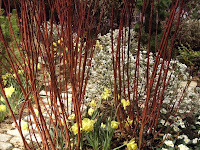 Red-twigged dogwood Cornus serinicea [right] and primroses (Primula) and daffodils (Narcissus) [left]. First, there was Boloco, a burrito joint on Beacon Street in Cleveland Circle. Two years ago, Chipotle moved in down the street and the first Burrito Battle of Cleveland Circle was joined. And in a few weeks the battle for the burrito dollars of Boston College undergraduate students will escalate into outright warfare. 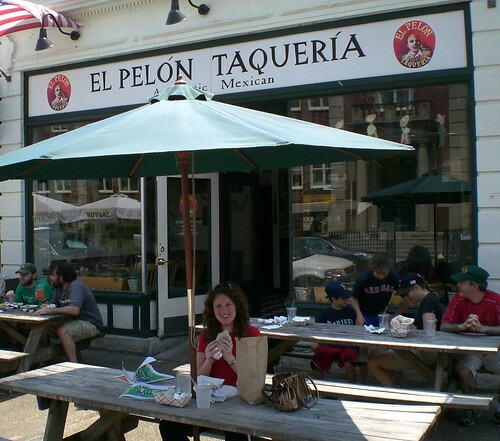 The Boston Restaurant Talk blog announces that El Pelon Taqueria, a store damaged by fire -- twice! -- in the Fenway, is moving to the top of Lake Street at 2197 Commonwealth Avenue, the former site of the College Sub Shop and across the street from BC. They plan to open March 15, although no word as of yet if they will be handing out free burritos on the first day like Chipotle did. What kind of weaponry will El Pelon bring to the battle? Their menu can be found at The Burrito Blog, natch. The only question I have is this: Do you eat your burrito with the outer end of the strip up or down? New Balance unveiled their "vision" for a $250 million mixed-use development project, first described here, at a neighborhood public meeting Wednesday night. Their development proposal was met with considerable skepticism -- from the current owners of the parcels of land New Balance wants to develop. The owners of two of the three big parcels tell the Boston Herald that there's no deal to sell the properties or their development rights to New Balance. “It’s inappropriate for New Balance to be presenting a proposal of what they would like to do on property owned by my company unless it’s a collaborative effort," Wanger said. “We’re not going to simply abandon our plans because New Balance has new ones." It is clear from an earlier Herald article that State Representative Michael Moran was previously knowledgeable and supportive of New Balance's proposal; State Representative Kevin Honan was supportive, too, in his comments today to the Herald. Why would New Balance present their proposals now before they have agreements on any of the parcels? One theory is that New Balance is trying to preempt Lowe's when they re-propose their own box store idea in the next few weeks. By showing an alternate development vision, New Balance is offering the neighborhood and the city an alternative to undermine the Lowe's project. Over in revenue-strapped City Hall a $250 million development probably looks a lot better than a more modest Lowe's store. But a more conspiratorial theory has been discussed around the neighborhood for the past few weeks: that New Balance is trying to win over public support for their project in order to pressure the current landowners into selling to New Balance instead of Lowe's. That would explain why New Balance has put so much preliminary effort into wooing the local state representatives over to their project -- and putting a commuter rail stop at nearby Everett Street. Update: Harry Mattison attended the meeting and offers his comments on the development proposal. State Representative Michael Moran [right] has voted identically with House Speaker Robert DeLeo on all 214 roll call votes since DeLeo became speaker, according to an analysis by David Bernstein at the Boston Phoenix. State Representative Kevin Honan has only voted differently from DeLeo once. "The Phoenix, in a review of roll-call votes since DeLeo became Speaker, has found an easing of the lock-step voting habits seen by Democrats under DiMasi. Overall, House Democrats have been twice as likely to vote against DeLeo and his leadership team as they were under DiMasi." Bernstein shows a clear pattern that the 18 of the 20 representatives most likely to vote along with the speaker have leadership positions (such as being a committee chairman and hence earning a bonus to their salary), while none of the 27 representatives least likely to vote with the speaker has a leadership position. Rep. Moran is chair of the Joint Committee on Election Laws, while Rep. Honan [left] is chair of the Joint Committee on Housing. A Brighton resident got a postcard with this picture in the mail today and forwarded it on to me. It's an artist/architect's rendering of the large development at Brighton Landing that New Balance is expected to put forward at a community meeting next week. The view is looking east; the Mass Pike runs up from the lower right corner of the picture. I've labeled the various features in the image -- the red text is mine, not New Balance's. The crossing of the Mass Pike looks to be more like a pedestrian bridge lined up with Litchfield Street -- not a flyover with on- and off-ramps -- which connects the proposed new development at Brighton Landing to the new Charlesview project a few blocks further north. Litchfield has residential buildings on its west side, light commercial on its east. According to at least one source who was briefed on New Balance's plans, their presentation included an additional flyover with looping ramps that is not included in this artist's rendering. Note: post was updated to clarify the issue of pedestrian bridge versus on-/off-ramp flyover. The economic downturn has given residents of Allston-Brighton a respite from major construction: Harvard University has stopped construction of their science complex in North Allston; and Boston College has announced a slowdown in capital construction on their main Chestnut Hill campus, with no word about construction on their new Brighton Campus (which is currently the subject of a lawsuit by two residents of Brighton). It looks like the lull in construction may be about to change. New Balance is poised to announce a major new project for Brighton Landing that would redevelop an industrial and commercial neighborhood into a mixed-use development. Word has been leaking out for a number of months that New Balance -- whose corporate headquarters is located next to WGBH's "nuclear aircraft carrier" in the Brighton Landing area alongside the Massachusetts Turnpike -- wishes to initiate a large development project on the currently under-utilized industrial and commercial land between their current buildings and the Stop-and-Shop grocery store to the east. The initial proposal that has been floated in the past months includes: two office towers (where one is for New Balance's own use to consolidate the corporate offices of their non-NB shoe brands); a movie theater/auditorium; luxury hotel; mixed residential housing and retail; and open green space running east-west in the middle of the project. The entire project is expected to be long-term and would be built in stages, possibly taking up to two decades to complete. The exact identification of the parcels involved was unclear to people briefed on the plans. The parcels in Brighton Landing have a variety of owners listed with the City of Boston assessors office and the Suffolk County Registry of Deeds, only several of which are Brighton Landing LLC, the proponent of the new development. (I have drawn the full possible area at right.) 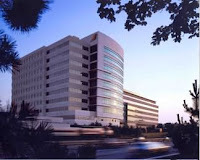 It is likewise unclear if they have entered into any purchase and sale contracts other property owners, but it would seem likely based on the maturity of their development proposal. Lowe's previously proposed to develop part of the site with a large box hardware store that met with the opposition of both neighborhood residents and Mayor Thomas Menino due to its negative transportation impacts on nearby streets. Lowe's later floated the idea again, albeit without filing a new proposal with the Boston Redevelopment Authority. The New Balance project concept would address its transportation impacts in two major ways: pushing for the state to locate a commuter rail station at Brighton Landing near Everett Street, which could also service diesel multiple unit trains; and building a new flyover on-/off-ramp for the Mass Pike (and/or a cloverleaf located further east by the Leo Birmingham Parkway). The current transportation constraints of the site are such that the Mass Pike ramps are a requirement for the project to move forward, according to those briefed on the plan. While the office towers would likely be buffered from existing residential neighborhoods, the pike ramp flyover might be located relatively close to the residential neighborhood of North Brighton along Lincoln Street. New Balance has not to date submitted their proposed development project to the BRA for review. Community Meeting: NB Guest Street Planning & Development is hosting a community meeting to present their "vision" of potential future development of Guest Street. The meeting will take place on February 10th at 6:30 p.m., on the 2nd floor at Brighton Landing, 20 Guest Street in Brighton. Update: Lowe's is on the schedule for Thursday's meeting of the Brighton Allston Improvement Association. Hard to know what that means, based on New Balance floating their own development ideas for what are likely to be some of the same parcels of land. Image of New Balance's headquarters in Brighton Landing from the NB Store website.